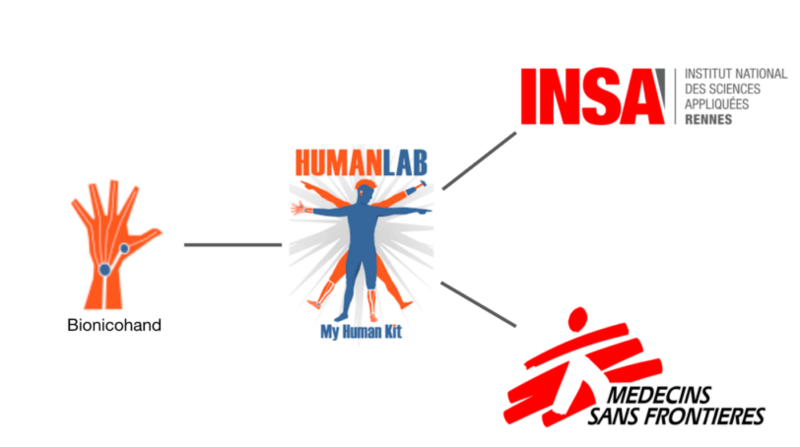 On Wednesday 18th October the first ever meeting at the Rennes Humanlab between My Human Kit, the National Institute of Applied Sciences of Rennes (INSA) and Doctors Without Borders took place. Every year since 2013, different 5th year student groups from INSA follow on from each other to make the Clem’Hand project advance (designing and 3D printing a mechanical hand for women). The current group started 2 weeks ago and will work on it for 4 months (the next deadline is in January 2018). The design for the hand will then be shared with Doctors Without Borders so that they can print it and test it on site in Jordan. On their own, Doctors Without Borders are testing socket and hand scans and prints using LimbForge and Standard Cyborg. In addition to 3D printing hands, they also 3D print masks for burn victims.